Samsung Electronics and Samsung Display are currently working on the final step of development of foldable Smartphone in order to produce prototype in third quarter of this year. While Samsung is working on this development, Chinese panel manufacturers are also accelerating their process of development of prototype of foldable displays. South Korean and Chinese companies are competing for their sense of pride with a title of ‘world’s first foldable Smartphone’ on the line. According to industries on the 13th, Samsung Electronics and Samsung Display have set a goal of releasing prototype of foldable Smartphone in this third quarter in order to verify quality of foldable Smartphone by producing thousands of prototypes. They are going to test quality and performance of these prototypes internally and check responses from markets in advance by supplying them to their major customers such as mobile network providers. When prototypes pass standards of quality and performance and seem to be able to induce certain amount of demands from markets, Samsung Electronics and Samsung Display are going to decide to mass-produce them officially. When prototypes are produced during third quarter, it is likely that official mass-production will take place in 2018. Samsung Electronics introduced its foldable Smartphone to only small amount of customers at MWC 2017. Buzz is that it really focused on protecting security of information so that information regarding its next new product not getting leaked as it even did not introduce its foldable Smartphone to its partners that had participated in development of this product. 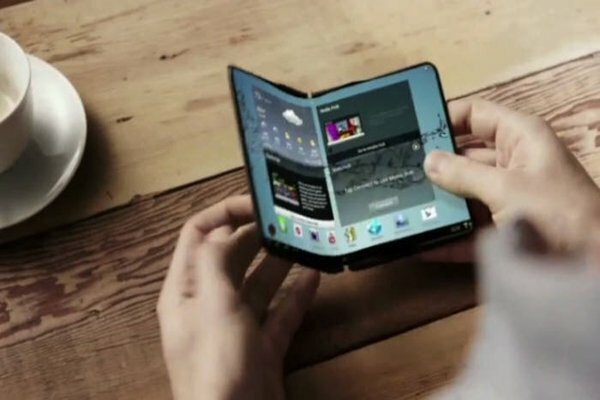 It is predicted that only major mobile network providers were able to see Samsung Electronics’ foldable Smartphone. It is heard that Samsung Electronics is working on making appearance of its foldable Smartphone more luxurious and elegant as it is an ultra premium Smartphone. Although its goal was to produce prototypes of this Smartphone in first quarter, it has delayed timing as it has invested more time into raising quality of entire product. Its strategy is to introduce a high-tech product that is one-step higher than regular flagship Smartphones. Samsung Electronics is devoting itself into manufacturing foldable Smartphone with luxurious design and high-quality that fit image of current Samsung brand. As foldable Smartphone is an innovative product that did not exist before, it believes that it will be able to expand related markets in the future after drawing positive experiences from foldable Smartphone users. Chinese companies are pursuing after development of foldable Smartphones very rapidly. Chinese panel manufacturers and Smartphone manufacturers are also going after ‘world’s first foldable Smartphone’ title. BOE, Visionox, and AUO introduced prototypes of foldable panels and they are working on mass-producing world’s first foldable Smartphones by working with Chinese Smartphone manufacturers such as LENOVO, OPPO, and VIVO. Each panel manufacturer is planning to supply prototypes of panels for foldable Smartphones from its flexible OLED mass-production line. In case of Samsung Display, it can supply prototypes from its A3 Line. Although there might be needs for investments on additional production lines when official mass-production and amount of supply are decided in the future, it is heard that currently there are not any problems regarding supply of foldable panels for prototypes. Chinese panel manufacturers are planning to manufacture prototypes from flexible OLED mass-production lines that they recently invested in. Although their experiences in mass-production of flexible OLEDs are absurdly low compared to South Korean panel manufacturers, it seems that they have approached level of being able to mass-produce these panels by quickly securing technologies after years of R&D. While Samsung Electronics and Samsung Display were working on increasing level of perfection of prototype of foldable Smartphone as much as they can, Chinese companies have rapidly pursued after South Korean companies. Since China is a late starter in both display and Smartphone industries, it can become a leading country in displays and Smartphones by securing ‘world’s first foldable Smartphone’ title.